Ford Motor Company celebrated their 50th Anniversary by revamping their widely popular F-series line of full-size pickup trucks in 1953. To get their product to market, Pepsi bottlers used trucks of varying size to ensure the shelves were well-stocked when shoppers were ready to buy. Using the highly detailed Authentics 1937 Lincoln Zephyr model, AutoWorld presents a replica of what a Pepsi bottler’s car from the late 1930s might look like. It’s the potent ’70 Chevy® Chevelle® SS™, seen, stolen and practically destroyed in the action movie thriller, Jack Reacher™! In filming the movie, they went through 8 Chevelle’s® to film the infamous chase scene. The car chase was the main highlight of the film, with the high powered Chevelle® speeding through the streets of Pittsburgh. Auto World® pays tribute to The King, Richard Petty®, with these accurately detailed stock car replicas and race trailers to match! The newest version of our best-selling Batman slot sets is the “Pursuit of the Penguin”. 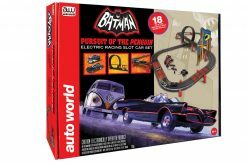 This all-new set includes great features such as looped track, Gotham City backdrop, Batman sticker sheet and two slot cars. It’s easy to set up and race! Comes packed in our convenient handle box and ready to race! At just 16 years old, Don Gay became the youngest NHRA champion in history when he drove this 1962 Super-Duty Catalina to the NHRA National Championship at Indianapolis Raceway Park in September 1963. Auto World pays tribute to the legendary Richard Petty with this 1972 Plymouth Road Runner. 1972 was his first year driving a car that was not entirely Petty Blue, but instead decked out in a paint scheme that would eventually come to represent all of STP’s racing operations. For the record 6th time in Indianapolis 500 history, a Chevrolet Corvette was chosen to pace the 88th running of the “Greatest Spectacle in Racing”. In 2010, the #3 pace car that was used in the race was sold at a Mecum auction for $112,000. These classic cartoon characters are ready to race! Auto World’s Looney Tunes slot cars feature iconic Looney Tunes characters and art. Evil was born amidst chrome and gasoline. The 1958 Plymouth Fury assembly line was in high gear cranking out new Detroit iron. Auto World is excited to introduce an all-new line of 1:64 accurately scaled die-cast cars. The new die-cast lines are designed in TRUE 1:64 scale all the way down to the finest details, wheels, and tires. Tear up your track with these Mustang and Hemi iconic anniversary cars. These slot cars have high speed while keeping control on curves and loops. Auto World®’s X-Traction® chassis has increased weight and wide rear tires for better traction and handling. An Ultra-G™ neodymium magnet gives the car its sticking power.